Hello from the rain! Is the May 4 through 11 date set for Kiwanda or still being pondered? The date is set, May 4th through 11th. So far the response has been underwhelming, as they say. There hasn't been any interested response except yours. Dave Rayborne said he might break away from a project one day and come out. Bob and I are still talking about coming up even if an actual meet doesn't happen. 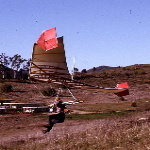 The idea has been posted in other forums and I've sent a personal e-mail to my list of hang glider flyers, both old timers and newer pilots. I didn't get any replies from that. I think it would help a huge amount if someone in Oregon would take this on and help promote it. At least it would probably move some of the state's pilots to come out. I have one principal concerne. I read in one internet search on Cape Kiwanda that paragliding has grown a lot there (in 2012 I only saw one and he was blown out). One internet site said that finding an opening for a hang glider launch was difficult. I can visualize that if there are a number of paragliders soaring that sand hill it would make it difficult and dangerous for a hang glider. I don't say this as any disparagement of paragliders, it's a practical matter of two different speeds. Paragliders can just about hover in the lift and they're all moving about that speed. A hang glider would be moving through them and paragliders take up a lot of vertical air space compared to hang gliders. I can visualize it as being like trying to fly through a bunch of giant nets without snagging one. I would love to hear from some local flyers about this. I don't want to travel 1200 miles to just sit and watch a sky full of paragliders. Dave, can you shed any light on this issue? I don't blame you there, I would not want to drive 1 mile to see the sky filled with paragliders! I really don't know how busy it is there during the week, maybe Ray will know more. I'll see if I have contact info for him. I have mixed feelings about posting this gathering to CBCC because they have a ton of pg members and some have been behaving very much like they have OD'd on Ooopsha Kool-Aid. It seems that a good portion of the pg crowd in the northwest enjoys being lemmings and showing up unannounced and en masse for some perverse self defeating reason. I don't want to travel 1200 miles to just sit and watch a sky full of paragliders. Oh boy! Reading between the lines of Dave's last posting, there a possibility of a Kiwanda hang gliding meet being deliberately sabotaged by a large "fly-in" of paragliders. This might be especially the case if the HG meet was being organized by someone from out of state (me) and also one of the attendees was a "persona non-grata" in a local flyer's (MF) mind. I definitely do not want to enter a multi-state turf war with another segment of the gliding community. Guess who would be outnumbered? Dave, I very much appreciate your enthusiasm for the reunion meet but considering the lack of response to the idea and the uncertainty of airspace availability and the distance from my home. I'm backing out of attempting to organize a HG Reunion meet at Cape Kiwanda. With no organized meet there, May 4th - 11th, if I decide to show up as an individual HG pilot I'll certainly let you (& 2 or 3 others in Oregon) know in case you wish to come down and join in flying some of the days. Since there will be no organized (by me) gathering, I reserve my decision as to whether I will drive up there or not, until much closer to May. As of now I'm dropping all of my Cape Kiwanda plans while remaining open to future decisions. I sound like a politician. If I saw that post from an average pilot, I would be urging you to NOT reward bullies by caving in. But you're not an average pilot. You're Frank Colver who invented, built, and flew his own personal balloon. You're Frank Colver who attended the first Otto Meet in 1971. You're Frank Colver who invented, built, and flew your own Skysail. You're Frank Colver who founded what became USHGA. You're Frank Colver who invented, built, and marketed the Colver Vario. You're Frank Colver who carried the ball for the 40th Otto Meet marker. You're Frank Colver who founded the Friends of Dockweiler. You're Frank Colver who offered to donate $20,000? $30,000? to USHPA's RRG if they would administer it fairly. You're Frank Colver who helped open Dockweiler to all hang glider pilots. You're Frank Colver who drove 2 days with me to help non-USHPA pilots of the RGSA. In short, you're Frank Colver who goes out into the world and accomplishes things. I think I'm going to assume you know what you're doing here.